Senior defensive end and Bednarik Award watch lister Dee Ford will be one of the keys to Auburn’s defense this year—make that one of the 88 keys. 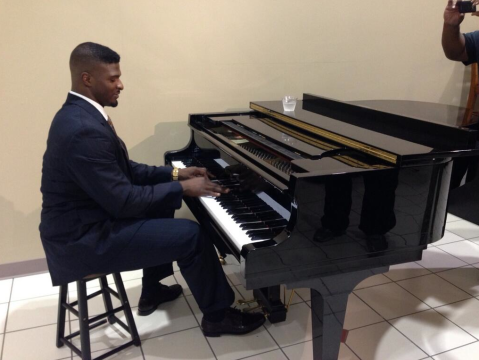 Here he is tickling the ivories for reporters at the Wynfrey Hotel in Birmingham before his appearance at SEC Media Days this afternoon. So good that Auburn produced a five minute video of Ford at the piano last fall that somehow seems to have gone mostly unnoticed. Related: VIDEO: Auburn players Jay Prosch, Dee Ford, Chris Davis stylin’ en route to SEC Media Days. I hope that video airs on CBS this fall! Dee Ford gettin theoretical with it.